A gang of criminals led by "Scar" Tobin; "Cockroach Conspiracy"
Powers: The Painter used a paintbrush and a set of paints with which he could create solid forms of things he painted. The paints enabled him to work at a vastly superhuman speed. He could animate and control his creations. He could even use the paints to mutate or transform others. The majority of his creations and changes faded away when he willed them to, or when he lost interest in them. His abilities appeared to be only limited by his imagination and access to the brush and paints. It is unclear whether the paints and brush worked through advanced science, magic, or a combination of the two. It is possible that the Painter was not actually human. His actual weaknesses and limitations are uncertain. (Strange Tales I#108/1 (fb)) - Although certain events have been called into question, the Painter himself described his origins as follows: He started out wanting to be a great artist, but lacked the talent. He began copying famous paintings and selling them, but his lack of attention to detail gave him away and he was sent to prison for three years. Upon his release, he attempted a career in counterfeiting, but his lack of attention to detail gave him away again, and he was discovered by the Human Torch and sent to prison once more. He tunneled through a loose section of flooring and came upon an underground cavern. On the wall was a painting showing space travellers who painted their own paths and adventures. When he was trapped by a cave-in, he painted a picture of himself passing through solid rock, and he then did so to escape. (Strange Tales I#108/1) - He allied himself with a gang of criminals to gain vengeance on the Human Torch -- why he did this was uncertain, unless he just wanted witnesses to his successes. He toyed with the Human Torch, easily defeating him with giant fire hydrants, tidal waves of sand, etc. However, his lack of attention to detail in his creations gave him away as van Vile, and the Torch managed to locate his headquarters and overhear his plans. The Torch then painted a duplicate of himself to fall victim to the Painter's plans, and then ambushed the Painter and destroyed his palate and brush, leaving him powerless. He was again sent to prison. (Ultimate Super-Villains) - Following his release from prison on parole, the Painter retired from crime and went to work as a commercial illustrator. One day he was ambushed in his home by his former partner, the now somewhat aged Scar Tobin, who tried to force him to surrender his magic paints. The Painter claimed that they had all been destroyed by the Human Torch, but when they began to try to beat the truth out of him, another Painter came to the door and the first one vanished, revealed as a mere self-portrait. The new Painter altered reality around them, but they managed to knock him out, too. Then a third Painter appeared, claiming he could keep this up all day, as the second Painter vanished. The Painter then banished Tobin and his cronies to Calcutta after revealing he was working on several other paintings in secret, but wished to keep a low profile to prevent the Fantastic Four or Dr. Strange from coming after him. (Web of Spider-Man#75 (fb)) - Under unknown circumstances, the Painter regained (and even increased) his abilities, but felt he lacked the inspiration to continue. To this end, he sought out two others who he felt could inspire him. The first was an unsuccessful performance artist known only as Spark. The second was a seven foot tall Russian mutant woman known as Bora, whose growth spurt at adolescence had ruined her dreams of becoming a ballerina. The Painter performed a mystic ritual which bound Bora and Spark's souls to his own, unleashing and magnifying their abilities, while gaining inspiration from them. Spark and Bora first used their abilities to engender more interest in Spark's performance art, which fell flat. 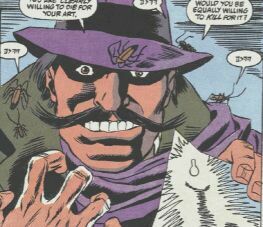 (Web of Spider-Man#74-76) - The Painter reappeared years later, covered with bugs with whom he communicated, and possessed of an artistic motivation. He met with and merged his soul with the mutant known as Bora and the performance artist known as Spark. He empowered Spark and sent him to battle Spider-Man, who defeated him. Next he had Bora use her powers, which he amplified, to create a magical blizzard over Manhattan. 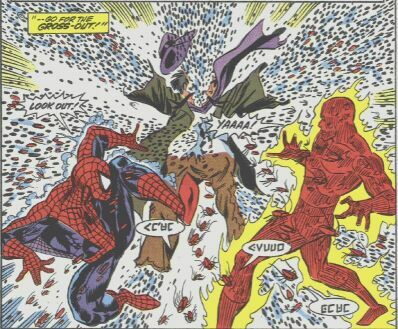 He had Bora and Spark attack the Human Torch and Spider-Man, and used his brush to rejuvenate them immediately after they were defeated. However, apparently growing bored with the senseless battle, he transformed Bora and Spark into two-dimensional lifeless images on his canvas. He then said, "To Quote the Macabre King: 'When all else fails, go for the gross out.' " and exploded into a shower of bugs. The remnants of his skin was found to be made of canvas. His true origins and fate remain uncertain. (Avenging Spider-Man#13) - In a high security prison and hypnotized by the Hypno-Hustler into seeing his deadliest foes, Spider-Man fought various freed prisoners, only discovering who each of his opponents were by the name on each cell; the Painter appeared as Morlun, but was quickly knocked out. Comments: Created by Stan Lee, R. Berns, and Jack Kirby; modified by Tony Isabella and Alex Saviuk. Painter's story was Chapter 7 in the novel. It was called "Private Exhibition" and written by Pierce Askegren. The story from the Ultimate Super-Villains novel fits perfectly into continuity (as do almost all of Askegren's stories), and can be thought to occur b/t Strange Tales I#108 and Web of Spider-Man#75(fb). Was he powered by science or magic? Was he even human? How much of his origin is true? Couldn't tell you. van Vile? Gotta be a pseudonym. So what's with the Painter appearing in prison in Avenging Spider-Man, bereft of his bugs? Nice to see him again after so many years, but ... what? Should we chalk up the Web of Spider-Man appearance as a Skrull imposter from the Secret Invasion? A mystical doppelganger animated by cockroaches? Tobin got his sub-profile after John McDonagh pointed out another appearance of him in the Spider-Man & Iron Man: Sabotage novel. The Painter has an entry in Marvel Legacy: The 1960s Handbook. The Painter is part of the as yet untold saga of the "Cockroach Conspiracy." According to carycomic: It could be that the first battle of wills, between Frank Johnson and Yucoya-tzin, was witnessed by the roach-possessed prospector Will Campbell, or one of his successors. And, shortly afterward, some of the bugs were delegated to use those same magical paints (which created Zzutak) to create an alternate host body! If such is the case, then the roach-possessed derelict on Broadway could have been spying on Wyatt Wingfoot (initially a good friend of Johnny Storm's) rather than the She-Hulk!! (Strange Tales I#108) - Tobin was the leader of the gang that aided the Painter against the Human Torch. (Ultimate Super-Villains) - Scar Tobin and his gang ambushed the painter in his home and tried to force him to surrender his magic paints. The Painter claimed all the paint was destryoed, so Tobin and his men beat him up, but the Painter was just a self-portrait of himself. They failed to get to the true Painter, who banished Tobin and his men to Calcutta. (Spider-Man/Iron Man: Sabotage) - Interpol found Christopher "Scar" Tobin in Calcutta without a passport.